Catriona and I were more than a little confused when our train pulled to an unexpected halt in what seemed like the middle of nowhere. And why was the woman seated behind us waking up her 9-year-old son? “Harry Potter” he breathed with his nose pressed up against the windowpane. I had already seen so much breathtaking scenery on Islay and Tiree that I think in a way I was starting to take it for granted. Like, apparently Scotland is just drop dead gorgeous everywhere, no big deal. Except this train ride was a big deal. And yes, we were passing over the bridge that the Hogwarts Express zooms over in Harry Potter. So I guess this train ride is also magical. Like… literally? Maybe! After our stay on Tiree Catriona and I got a ferry to Oban. 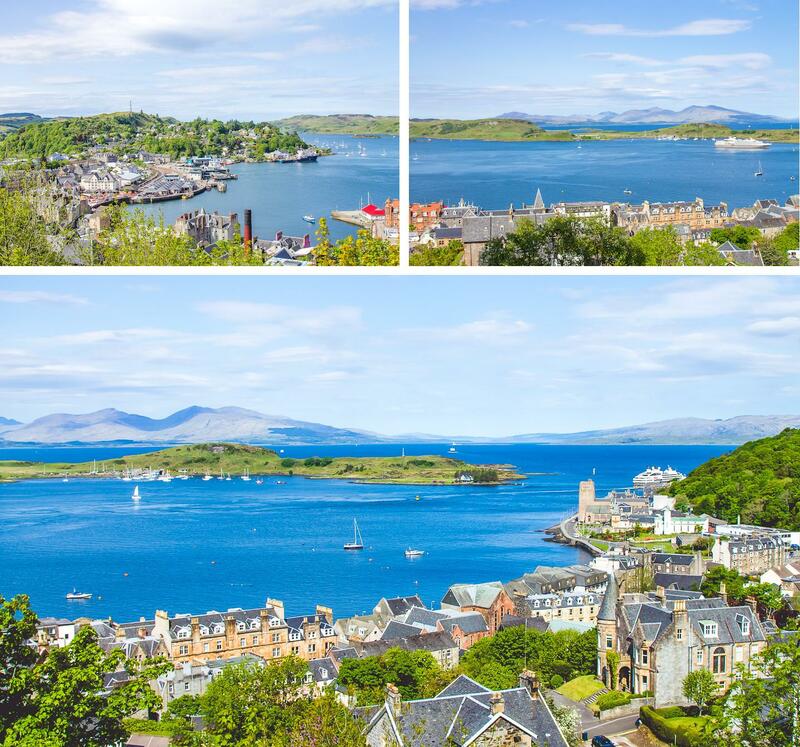 I had heard really mixed things about Oban – from raves about how gorgeous its location is to complaints that it is gray and rainy everyday ever. But I guess we lucked out, because it was sunny and gorgeous when we arrived and I couldn’t have loved it more! I mean, when we walked up to our guest house for the night and were greeted by this view, how could I not fall in love? 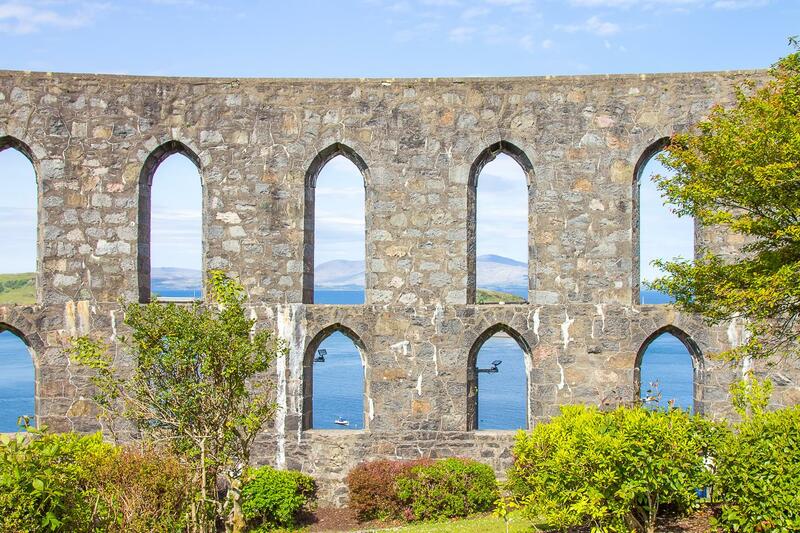 We only had a few hours in Oban so in the morning we headed straight up to McCaig’s Tower (which was actually just a couple of minutes away from our guest house) for some more of those famous Oban views. 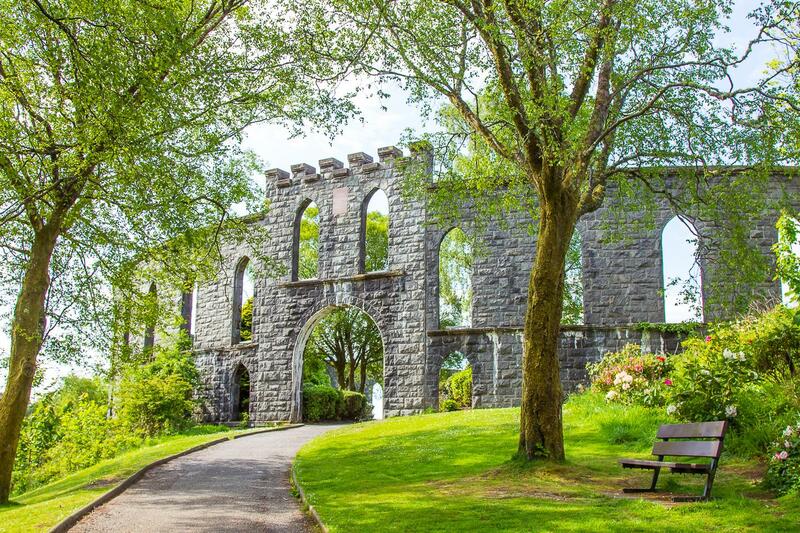 Seriously, how pretty are Oban’s surroundings? I know we were lucky with the clear skies, but I can’t imagine Oban not looking magical, even in the rain. After stopping for a quick coffee on the harbor (because priorities) we hopped on the train for Mallaig, where the next day we’d be getting the ferry to the Isle of Skye. And that’s where the magic started. We could have gotten a bus from Oban to Skye instead, but I’m so glad we opted for the train! The scenery just got prettier and prettier, and while I had had big plans of editing photos and putting together my Tiree video on the journey, I ended up spending most of it with my forehead pressed against the train window. Why is Scotland so pretty? It can’t be fair. 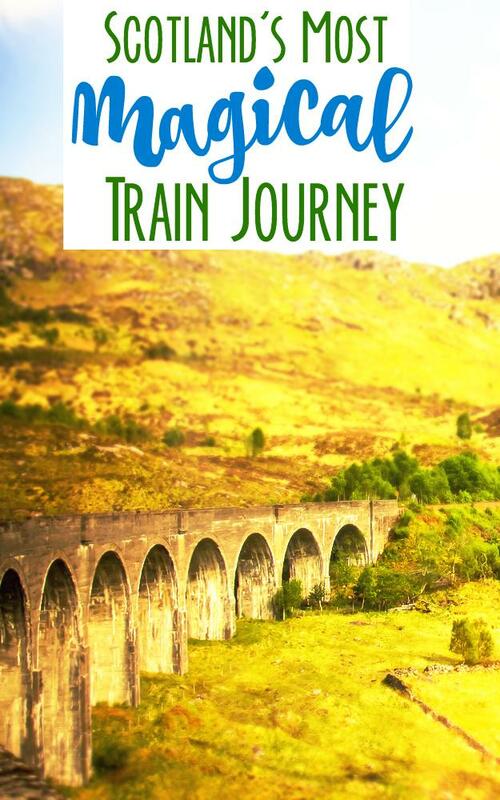 It’s no wonder the West Highland Railway Line keeps making lists of the world’s best train journeys. You can actually go full on tourist and take a steam train along the line – we drove past one and it did look like loads of fun. 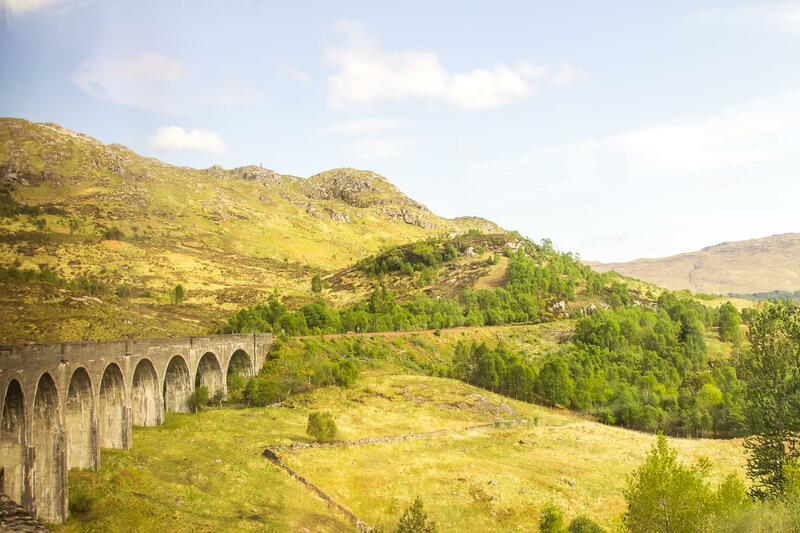 But even the regular train felt a bit special, and I loved that they still stopped on the Glenfinnan Viaduct for everyone to get in their Harry Potter selfies. And guys, I also just realized that I took some video clips in Oban and on the train that I completely forgot about, so I’ve quickly pasted them together to give you a bit of a better sense of the experience. Don’t mind the smudge on the train window – that’s from my forehead of course! The ferry from Tiree to Oban with CalMac Ferries took four hours and cost £10.30. 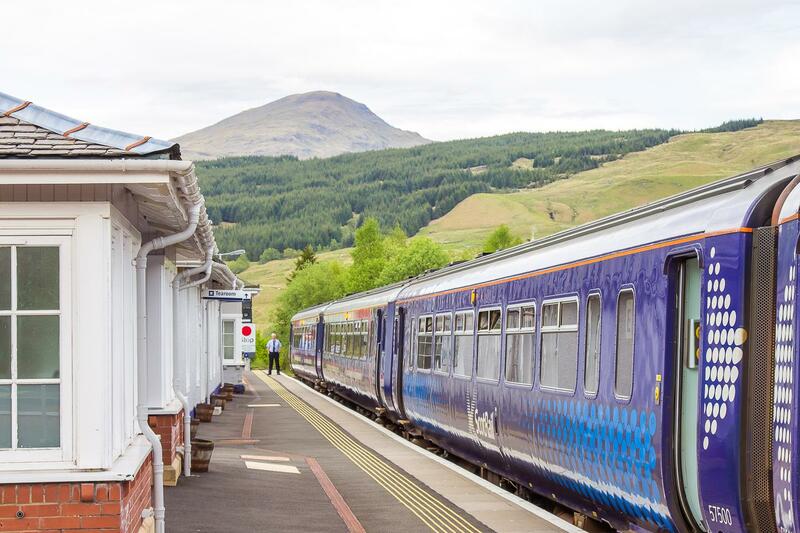 The train from Oban to Mallaig was £32.10 and we had to change in Crianlarich. Scottish weather is unpredictable! I packed a lot of cold weather clothing for this trip, because Scotland, but then it ended up being sunny and incredibly hot for most of the trip. 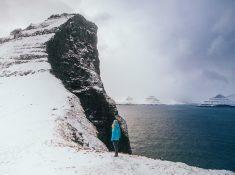 So you’ll want to bring a good variety of clothing, so that you’re prepared for whatever Scottish weather might throw at you. 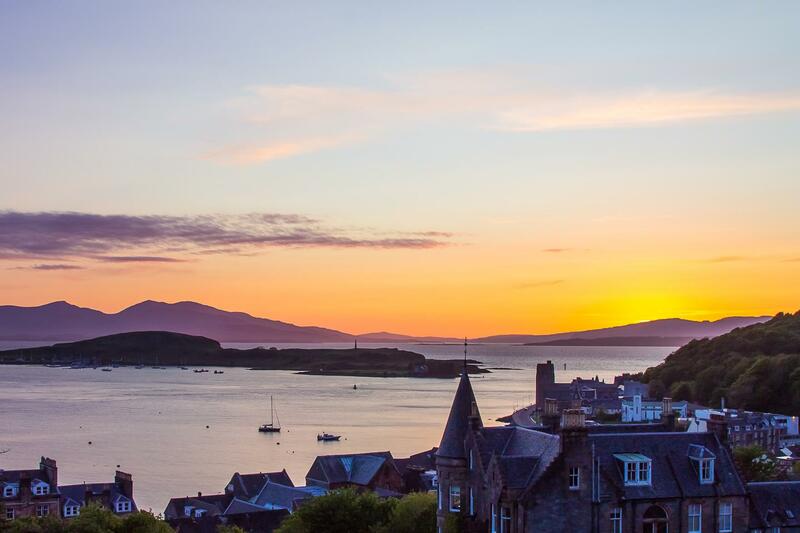 I completely fell in love with Oban when I visited earlier this summer! The views (and setting) really are incredible. Your posts make me wish I’d had more time and gotten out to the Hebrides. Such magical beaches! I never thought I’d go to Scotland and fall in love with a beach/sea town. As you said it’s definitely not all cows and castles! Right? I was surprised to find so many gorgeous beaches there! Five years I lived in Oban, and I never once took that train! And me, a self-confessed train geek! tsk! You were so spectacularly lucky with the weather, when the sun shines on the west of Scotland, it is heaven on earth.